Send something that will remind them of you every time they indulge! 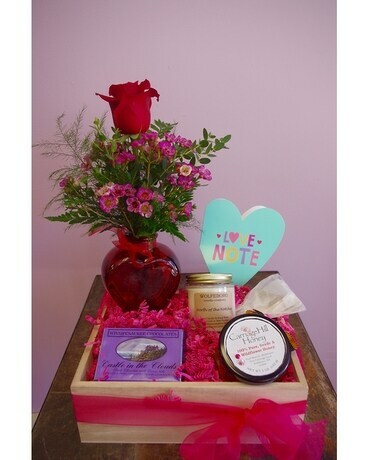 A Gift Box featuring our blooms and the following~ Winnipesaukee Chocolates: Locally hand crafted chocolates with an agenda. 10% of profits go to local conservation efforts. Wolfeboro Candle Company: Local, natural, non-gmo, pure soy wax candles with premium grade fragrances. We’ve included their floral fragrance, North of the Notches. Carriage Hill Honey: Popularly found at the Wolfeboro Farmers Market, Fred Martin’s carriage hill honey pairs nicely with a complimentary bag of tea.